How does a big company that is not exactly at a loss for new product ideas drive innovation? When a PepsiCo division focused on “breakthrough innovations” was looking for a second opinion on a slew of new product ideas, it didn’t turn to consultants or muster up a traditional focus group. With one day and “no budget pretty much,” Witmer showed the MassChallenge entrepreneurs her innovation team’s ideas, first getting their feedback as consumers and then asking them to exercise their business savvy. 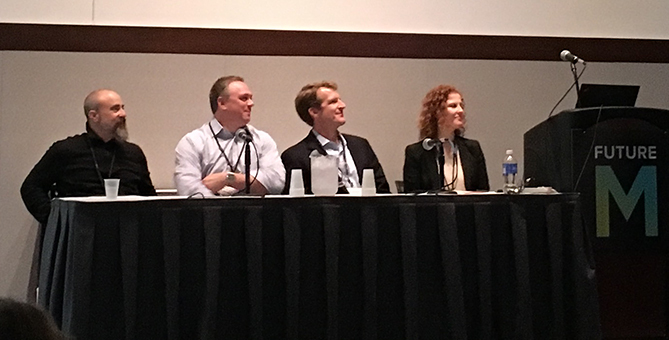 “We then had them each pick their favorite idea and pitch it to a panel of consumers,” Witmer told the audience at the FutureM marketing technology conference, where she was a featured speaker. The consumers, in turn, were asked to invest in what they believed was the winning pitch. “The upshot was that we were able to sit down with the consumers again and understand what drove their decision making,” she said. Her team got real-time insight into how entrepreneurs think about products — and how they pitch a product, she said. The PepsiCo innovation team also gleaned valuable information about what might drive and hold back their new products. Constant Contact, an online marketing firm focused on helping small businesses, created its own accelerator program, said Andy Miller, chief innovation architect. The Waltham, Mass. firm brings in two classes of startups, two times a year to drive innovation. PepsiCo and Constant Contact are hardly alone in their cultivation of startups to drive innovation — and identify potential threats to their core businesses. 82% of large companies say they can learn from startups/entrepreneurs about how to become a digital business. 50% of large companies feel they need to work with entrepreneurs to be sufficiently innovative. Large companies expect the proportion of their revenues generated by collaboration with entrepreneurs to more than double over the next five years, from an average of 9% today to 20%. 78% of large companies say that working with entrepreneurs is important or critical to their own growth and to drive innovation. Only 67% of entrepreneurs agree with the above sentiments. Entrepreneurs are four times more likely than large companies to say their counterparts lack commitment to working together (29% versus 7%). Accenture’s viewpoint is that the disconnect between the big guys and startups is puts about $1.5 trillion in global growth at risk ($433 billion in the United States). We’re curious to know whether your company is working with startups to drive innovation and speed their routes to digital business. Innovation panel at FutureM (from left to right): Adam Cutler, IBM; Andy Miller, Constant Contact; Richard Smyers, Fidelity Investments; Perry Witmer, PepsiCo.